The thought of creating your own website may seem overwhelming. You might even think this task would be impossible for anyone but a developer or a person with a background in web design. Well, I have good news for you — there’s a software out there that’s so easy to use, virtually anyone can successfully create a unique and professional-looking website for their business, blog, portfolio, and more. It’s called WordPress. This ultimate guide will cover a basic step-by-step process of creating your own WordPress website as well as a list of tips and tricks to remember while working with WordPress. But first, let’s answer the question most people have when they begin thinking about their new WordPress website: What is the difference between WordPress.org and WordPress.com? The difference between WordPress.org and WordPress.com has to do with who is actually hosting your website. You host your own website or blog on WordPress.org, through a third-party hosting provider. You also have to download your WordPress software, buy a domain name on a third-party site, and manage your server. It’s a much more hands-on experience than with WordPress.com. Also, your URL with a WordPress.org site will look like this: www.mywebsite.com. WordPress.com offers to host your website for you. You also don’t need to download any software or manage a server. If you choose WordPress.com, your website’s URL will look like this: www.mywebsite.wordpress.com. However, you have the option to also upgrade your WordPress.com account and buy a custom domain from a third-party provider (meaning your URL will look like this: www.mywebsite.com). You may be wondering whether WordPress.org or WordPress.com would be a better fit for you. Let’s review a few more of the pros and cons that come with both options so you can make an informed decision. WordPress.org is ideal if you want full power over customizing and controlling your website. However, there is a lot more responsibility that comes with managing a WordPress.org website site. You have to purchase and set up your own domain name, upload and install all of your custom plugins and themes, edit your website’s code, and manage your website’s security. WordPress.org is free to use, but you have to pay for everything else that goes into having a website (including but not limited to everything I’ve just listed). WordPress.com is preferable if you’re looking for an option that has most of the hard work done for you. You’ll never need to manage your server, pay for your hosting, or buy a domain. There are also a number of customization options that come with a WordPress.com plan to help you make your website look the way you want it to. WordPress.com has a free and paid version. If you stick with the free version, you can’t upload any custom themes or plugins, and you will have a WordPress subdomain. However, there is always the option to pay for premium upgrades and other plans that provide you with even more features and control, as well as the option to buy a custom domain through a third-party site. There are a number of ways for you to create your dream website with WordPress. Users generally find the software easy to use, but getting started can be understandably intimidating if you’re completely new to the process. That’s why we have built this “WordPress for beginners” guide. Below, we will cover how to start creating your website. WordPress is one of the most popular CMS options available today according to TechRadar. Its ease of use and versatility enable the majority of users and business owners to create a website that works for their needs with the software. Here’s how you can do the same. To begin creating your website, pick a WordPress plan. As stated earlier, with WordPress.org, you only have one (free) plan option — but it requires you to buy your domain, hosting provider, plugins, themes, and everything else related to your WordPress site. When it comes to WordPress.com, you’ll have to choose between the four plans they offer. The main differences between the four plans include the monthly fee, your ability to create a custom domain, and their number of features. Setting up your domain name and choosing your hosting provider typically happen around the same time in the website creation process. Before we talk about how to complete those tasks, let’s cover the difference between your domain name and hosting provider. Think about your domain name as your home address — it’s how your visitors are able to locate your website on the internet. Your hosting provider is where your website is actually stored. Without a hosting provider, your site wouldn’t have space on a server to “live”. To put it in simpler terms: Imagine your domain name is your home address and your hosting provider is your house. Your data files, which make up your website, are the furniture in your house. Your domain name will look something like this: www.example.com. An example of a popular hosting provider is WP Engine, which you can learn more about here. Again, WordPress.org requires you to create your own domain and find a third-party hosting provider for your website. WordPress.com allows you to decide whether or not you want a custom domain depending on the plan you choose, but you will still have to find a third-party hosting provider. There are hundreds of third-party hosting services, such as GoDaddy or Bluehost, that provide you with the ability to create custom domain names. (Again, this is why so many people pick their domain and hosting provider at the same time in the website creation process.) Your hosting provider is important — not just because it’s how you host your site — but because it impacts your website’s speed, security, reliability, and more. Side note: If you are new to WordPress.com but have already purchased and created a domain name elsewhere, no problem — you’ll have the option to transfer or map it to your WordPress website. For the sake of this guide, let’s assume you do not have a domain or hosting provider at this point. Here’s how to start creating your website on a third-party hosting site like Bluehost. First, head to Bluehost’s website and click “Get Started”. From here, you’ll be taken to Bluehost’s pricing page to choose from three different plans. Once you choose your plan and click “Select”, you’ll be taken to another page to sign up with a domain name. Once you select your domain name, you’ll be brought to a page to complete your account and billing information for your purchase. After confirming your account and purchasing your domain, you will gain access to your hosting dashboard where you’ll be able to install WordPress. If you are using a hosting provider outside of WordPress, you’ll need to install the CMS to connect your new domain to your website. To start, log into your GoDaddy account, click “Web Hosting”, and then “Manage”. You will be brought to a screen with your account details. Scroll down and under “Options & Settings”, you will see an area titled “Popular Apps”. Click on the WordPress app to begin the installation. After installing WordPress, there will be a few questions to answer related to the domain you want to use, the directory where you want to install WordPress, and your admin information. After about 24 hours, your website will be installed to your hosting account, and GoDaddy will send you an email confirmation. Now that you have your domain set up and WordPress installed, we need to set up your “Primary Domain” within WordPress so your visitors are actually sent to your website when they search your URL. In WordPress, go to “My Site” and click “Domains”. Select the custom domain you want to make primary. Confirm you meant to make this change by clicking “Update Primary Domain”. Verify the update was successful by looking for a green box with a checkmark that says “Primary Domain”. Onto step four — making your website look nice. You can customize your website using WordPress’ themes and templates, which contain a multitude of layouts, formatting styles, colors, fonts, and other visual options. 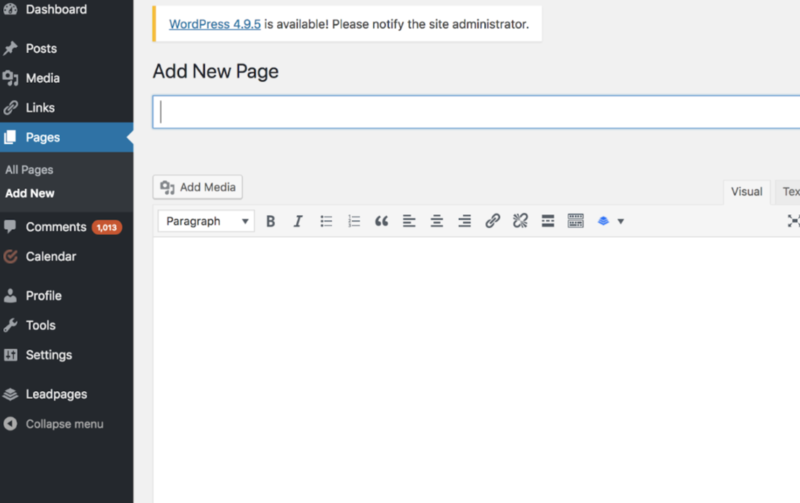 WordPress automatically provides you with a default theme that looks rather plain. Sure, you can keep it … but your website visitors may not be so impressed. A custom WordPress theme, whether it’s paid or free, will make your website appealing to your buyer personas as well as ensure it looks professional. Similar to the wide range of hosting providers available, there are also hundreds of themes and templates to choose from. That’s why we’ve put together a guide to 19 of our favorite themes and templates and categorized them by purpose. Whether you’re looking for a theme versatile enough for multiple different business types, or one suitable for your ecommerce site, portfolio, blog, or niche business, there’s a theme that will work for your specific needs. To find a theme that works best for you, head to your WordPress admin dashboard. Click “Appearance” and then “Themes”. You will then be brought to another screen to browse all available themes or search for a specific one you have in mind. Once you discover the perfect theme, simply “Install” it to begin customizing it and adding your own content, posts, and pages. Each theme has different steps required of you during the customization process, so be sure to follow them closely. Each theme’s website (which are often accessible through the WordPress theme and template library) has helpful information as you work through the customization process. When you add content to your WordPress website, it’s displayed in the form of posts and pages. Posts (or “dynamic pages”) are typically used for blogs and portfolios because they automatically place your newest website content at the top. Pages are static which is why they often appeal to business owners — the added content always remains in the same place. Start by deciding whether you want a post or page to serve as the homepage (or any page) of your website. To add a post to your website, go to the admin page, click “Posts” and then “Add New”. From this screen, add a title for your post, insert photos, change the format, and more. Click “Save” to save your changes as a draft or “Publish” so the post immediately goes live. If you’re looking to add a page to your website, you’ll work through a very similar process. In your admin area, click “Pages” and then “Add New”. First, add a title to your page. Next, insert photos, embed videos, add written content and links, and more. Follow the same steps to create multiple pages for your website if you choose. Click “Save” to save your changes as a draft or “Publish” so the page immediately goes live. There are a number of ways to further customize your website. Let’s review a few of the more common customization options. First, create static or dynamic pages under the “Settings” tab in your WordPress admin page. Consider using a static page if you’re a business owner who prefers having content remain in one place on your website. For example, it wouldn’t make sense for your “About Us” page to contain content that moves around — you’d want that content to remain in one location for consistency. Consider using a dynamic page if you’re a blogger who prefers having your newest content appear at the top of your pages. This way your visitors can easily find your latest posts. Titles can also be customized — to do this, head to your admin page. Under the “General” section in “Settings”, add a website title and tagline. One particularly handy customization feature is a navigation bar. This enables your visitors to easily move around your website and find whatever they need. You can add a navigation bar by going to your admin page, clicking “Appearance” and then “Menus”. From here, you can determine how you want your bar to look, how many pages you want to include, what you want to title those pages, what order you want them to be listed in, and more. Click here for more information on your WordPress site settings and customization options. Plugins are how you choose options and themes. They also enhance user experience with the help of features that your WordPress website doesn’t automatically include. With over 56,000 available plugins, there are options for most every type of website and user. Some of the most popular plugins available include WordPress Contact Form, Yoast SEO, TablePress, The SEO Framework, HubSpot Conversion Tools, and Pixel Caffeine. To begin installation, head to the “Plugins” button in your admin area. Browse or search for your desired plugin and then click “Install Now”. You should now have access to your new plugin. There are a number of WordPress tips and tricks to make your website as impactful and user-friendly as possible — we’ve listed 20 of them below to help you do just that. 1. Focus on the basics and create a great user experience with a WordPress theme that complements your business and website content. 2. Use dashes and not underscores when naming your files in WordPress. Google looks as underscores as joiners, meaning your file will look like one big word. That won’t help you with your SEO. Use dashes to make it obvious there are separate words. (For example, use www.example.com/this-is-an-example, not www.example.com/this_is_an_example). 3. Use WordPress’ online support for any questions or concerns you may have while creating or using your website. There are a number of forums and ways to reach out to WordPress experts listed on their website. 4. Use Image Alt Text to your advantage. Image Alt Text can be used to improve your SEO and Google rankings when used appropriately. 5. Keep your sidebar as organized as possible. Stick to the essentials and think about what your website visitors and buyer personas really need quick and easy access to. 6. Back up your website regularly so if you ever lose access or have technological difficulties, you have everything you need to completely restore your content. There are a number of plugins, such as Backup Buddy, made specifically for backing up your WordPress content. 7. Learn and understand SEO basics to ensure your website is completely optimized so you can boost your conversions. 8. Create a custom homepage. As mentioned earlier, WordPress will provide you with a default homepage. Take the time to create your own with a theme that works for your business — remember, this is your visitor’s first impression of your business, blog, or portfolio. 9. Keep an eye on your website’s performance and know what is and isn’t working for your visitors. There are a number of useful WordPress plugins to help with this. 11. Make sure your site is secure to ensure there are no hackers gaining entry. Again, there are plenty of plugins to help you with this. 12. Create custom permalinks. Permalinks are the permanent URLs that you plan to keep static for the foreseeable future. They’re important because they improve user experience and enhance your SEO. 13. Create a custom navigation bar (as we reviewed earlier) to make your site easy to use for your visitors. 14. Include excerpts and a click-through on your blog posts so people don’t land on your blog page and see your entire piece at once. By only including excerpts on your blog page, you make room to list all of your blogs in one location. Visitors can then read the excerpts and click-through to read the posts they are most interested in. 15. Structure your website in a way that makes sense for your business, visitors, and buyer personas. For example, use posts if you’re a blogger and use pages if you’re a business owner. 16. Remove “Comment” and “Share” buttons from specific pages of your website. You don’t need (or want) a “Comment” or “Share” button on your “About Us” page, or any of your service pages for that matter. 17. Consider what your website looks like on mobile. It’s no secret people are searching the internet while on their phones, tablets, and other mobile devices these days. Consider using a plugin to help you achieve a responsive, mobile WordPress design. 18. Use visuals and video content when possible to break up the text on your website pages. 19. Update your WordPress site and your plugins regularly. WordPress will tell you when updates are released. This will keep your website looking fresh and working efficiently. 20. Use social proof to show your new website visitors how many other people have already subscribed to your site and content. There are plugins to help you do this in a matter of minutes. Having a great website matters. It’s how you connect with your visitors and leads, create a positive first impression with new users, and boost conversions. The good news is creating your own website doesn’t have to be a daunting process … at least not with WordPress. The easy-to-use CMS offers completely customizable plans suitable for all needs. With no prior knowledge necessary, you can start building your own site for your business, blog, portfolio, or online store immediately.